We meet the third Thursday of the month at Barnes & Noble Booksellers, Pittsford Plaza, 3349 Monroe Ave., at 7:30 p.m.
April 17: James Reilly, head of the Image Permanence Institute (IMP) at Rochester Institute of Technology, will speak on “How to Preserve Analog Photography in a Digital Age.” IMP’s 16 staff members oversee 100,000 photos and have helped archives, libraries and museums since 1985. May 15: Nicholas M. Graver will present “The Skylight Photo Studio Tour of the Finger Lakes,” highlights of 30 years’ touring the beautiful Finger Lakes region.See eight former Skylight Studios, famous photographers’ homes, and the sites of historic images, landmark books, inventors, and historic architecture along the way. A full-day field trip (11 hours and 180 miles of driving) is now a slide lecture. Photographic History unfolded all around our region, and we can still enjoy so much of it. June 19 : “The Rochester Connection to Space Photography and Imaging” will be given by Jeff Wynn. He is a Rochester Institute of Technology graduate with a degree in Mechanical Engineering. His over 37- year career at Eastman Kodak included many engineering positions involved in the design and developmentof sophisticated camera imaging systems for space-based photography, including Lunar Orbiter and the recently declassified reconnaissance satellite programs. Hisengineering management positions included program manager for the Chandra X-Ray Telescope and general manager of the Image Acquisition Systems business unit. For the past decade he has been working as an engineering and program development consultant with ITT Exelis. Summer picnic to be announced. September 18: Tom Hope, photographer extraordinaire, will tell us more about his life in photography, telling of his role as executive producer for the 1949 Lone Ranger show. For 32 years he produced “The Hope Report,” with market research in the audiovisual world for schools and companies. PhotoHistory XVI: an international symposium at George Eastman House and trade show at the DoubleTree. See www.tphs.org. Our new PhotoHistory XVI Program Chairman, Martin Scott, and his committee, is evaluating the response to the Call for Papers, and will announce results next month. The PhotoHistory committee is asking for help getting sponsors to help defray the ticket cost for the symposium. The March 20 TPHS meeting was a success in spite of some mechanical difficulties toward the end of the projected movie, “We Do The Rest.” A take-off on Eastman’s marketing phrase, “You press the button, we do the rest,” the film introduced the Kodak Camera Club. When the now defunct Kodak Camera Club was being dismantled, Mike Champlin rescued the film and restored it onto digital. The 1956 film depicted a security guard, Roland Beach, walking through the camera club, when it was empty of its many members. The film then showed, with voice-over, the myriads of cameras, lenses, and projectors available for the 10,000 members to check out. It was billed as the largest camera club in the world, but the filmmaker, Daan Zwick, noted that he later learned that one in Russia supposedly had 15,000 members. The film reported that 17,000 pieces of equipment were loaned out each year, from a flash gun to sound films, including cartoons and travelogues. Movie night tickets were snapped up by the members. The club had seven full-time staff members, free instructions, and 20 paid instructors for a number of topics. The club was in Building 4, before Building 28 became its location (under the present Theatre on the Ridge). The film showed Lew Gibson speaking on photographing a butterfly, bringing in a section of tree trunk for background, and a cold lethargic butterfly ready to pose. The Camera Club also offered lecture series, such as a well-known naturalist, and teach-ins. The filmmaker, Daan Zwick, attended the meeting with his wife, Janice. Daan (pronounced Don) was most informative, telling the audience that he used a 16 mm Kodak Cine´ Special. In later films he used a Bolex. He noted that the field trip pictured in the film was a trek to Holy Sepulcher Cemetery. Daan began working for Kodak in 1944, and worked in the research lab. While at Kodak he also trained at CBS labs in New York City, and later NBC. Daan also noted that he was photographed in a canoe on the Genesee River, resulting in a small Colorama at the Rochester airport. Thank you to Martin Scott, who knew Daan and made the connection for him to attend our meeting. Sharon and Jack Bloemendaal took classes at the Kodak Camera Club in 1964 and 1965, when they first came to Rochester. She studied “Beginning Black-and-White Photography” while Jack took “Color Printing.” Later, both took a portraiture class. She showed a picture she had taken of Jack using one of the KCC studio cameras. She titled it, “Smile?” She also displayed a Christmas picture taken by another KCC member– of the two of them surrounded by a holly wreath. Incidentally, Jack came home on March 18 and is recovering slowly from his broken hip. 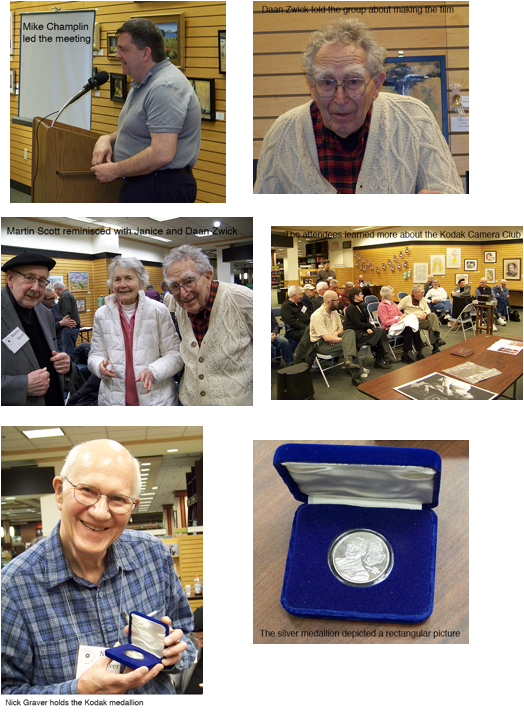 Nick Graver displayed a silver medallion purchased at the Eastman Kodak store. He found it quite amusing that the medallion pictured George Eastman, a No. 1 camera and a rectangular photo. The No. 1 camera took ROUND photos. He reported that a young man in England bought Ogden’s cigarettes with photos in the each pack. The man lived to be 99.8 years old. He was the renowned optics designer and author, Rudolf Kingslake, who presented the book to Martin, his friend and fellow TPHS member (and later his biographer) when he was downsizing. April 11-12: New York Photo Show 111 East 59th St. in Manhattan. Works by famous photographers, antique images, photography books. (www.usphotoshows.com, Steven Yager (703) 846-5555, syager@aol.com. This entry was posted in news and tagged camera club, Colorama, Daan Zwick, Image Permanence Institute, Jack Bloemendaal, James Reilly, Jeff Wynn, Kodak, Martin Scott, Mike Champlin, Nicholas M. Graver, photo antiques, Photographic Historical Society, photographic history, photography, PhotoHistory, PhotoHistory XVI, preservation, roc, Rochester, Rochester Institute of Technology, Rudolf Kingslake, Sharon Bloemendaal, space photography, symposium’s, The Photographic Historical Society, The Photographic Historical Society of Rochester, Tom Hope. Bookmark the permalink.